Our own product line Vigore offers a range of nutritional products, composed of organic and natural fertilizers, and biostimulants that, being respectful to the environment and totally natural, both in their raw material and in the manufacturing process, contribute a complete and balanced composition with the active principles required by the plant for its proper vegetative development. The product improves crop´s development, in terms of fruit production and quality, and can be applied in any type of crop. In addition, these fertilizers are able to improve the plants and crops, in terms of production and quality of the fruits obtained , so that such fertilizers can be applied in any type of crop, especially organic farming. These organic fertilizers provide more nutrients to plants in a natural way, one of the premises of organic farming. The products are excellent to improve the performance of crops of the ecological cultivation orchard. The main objectives of organic agriculture are to obtain healthy food, of higher nutritional quality, without the presence of substances of chemical synthesis and obtained through sustainable procedures. This type of agriculture is a global production management system that increases and enhances health of agro-systems, including biological diversity, biological cycles and soil biological activity. It could be achieved by applying, whenever possible, agronomic, biological and mechanical methods, as opposed to the use of synthetic materials to perform a specific function of the system. This way of production, besides taking into account the ecological aspect, includes in its philosophy the improvement of living conditions of its practitioners, in such way that it is posible to achieve the integral sustainability of agricultural production system. Consequently , to develop a social, ecological and economically sustainable agrosystem. The ecological cultivation must be based on preventive methods, stimulating good development of the plants and therefore their natural resistance to pests and diseases. Prevention should be maximized by adequate cultivation method that ensures good development and resistance of the plants . Indigenous species and a suitable fertilizer make the plants more resistant. As natural as humus and important as irrigation water, this type of ecological fertilizer has a positive impact on plants and crops, so this fertilizer is postulated as a key factor in favor of organic farming as much as water or humus. All in all, the wide variety of organic fertilizer products offered by Vigore improve the plants and the crops in general, not only in the production but also in the quality of the fruits that are obtained from the plants. In this way, this ecological fertilizer can be used in any type of crop, especially in those related to organic farming. 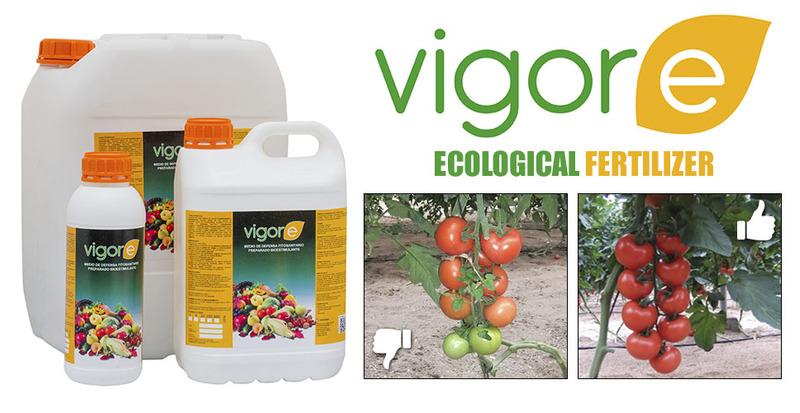 The ecological fertilizers that can be found within the Vigore range are: Vigore Eco, Vigore Plus, Vigore CalciumB, Vigore Potasium, Vigore Complex, Vigore Soil Activator, Vigore Amino acids, Vigore Multivigore and Vigore Calcium Organic. 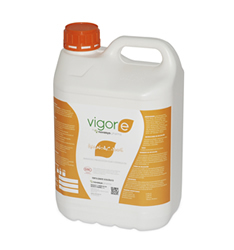 Vigore is a liquid fertilizer of natural origin, obtained from a mixture of different cyanobacteria strains which enable to obtain a balanced mixture of nutrients for the correct growth development of plant. It acts as a fortifier,stimulator of plant growth and reactivator of the plant’s natural defenses. It can be applied when the seeds germinate and at anytime of the crop cycle , providing fruits of a better quality. – The growth of the tissue of the roots, namely, it has a rooting effect. – It stimulates vegetable growth, favouring the multiplication of the cells. – It multiplies the new sprouts and a better setting of flowers. – Increase of agricultural performance. – It reduces the post-transplant stress. – As a strenghthener in situations of environmental stress, caused by extreme (high or low) temperatures, salinity of the soil or water deficit. – After suffering damages caused by chemical (fitoxicities), biological (pests) or mechanical agents. – It causes the activation of natural defences by which the vegetables establish their mechanisms of protection against the attack of pest or diseases. The fertilizer prepared with a bio-stimulant and phyto-strenghthener action, having its active principle in an extract of phaeophytas, formulated in a manner which significantly favours the setting and fattening of fruits, as well as the commercial quality of calibre,colour and maturing. Theblooming, favouring the formation of flowers with pollen of a good quality and a bettersetting. • It accelerates the fattening of fruits. • It increases the performance of the crops, in terms of better quality and quantity. • The product provides, at the same time a greater uniformity not only regarding the size as the external appearance, but as well greater shine and consistence. • It activates its natural defences necessary for vegetables to establish their mechanisms of protection faced with pests and diseases. It is a product formulated from different compounds of complexed Calcium and Boron. It is designed for foliar application as a corrector of deficiencies caused by lack of necessary elements or a bad absorption, thus the applied complexed calcium is assimilated very quickly. It must be used as a preventive measure in ordinary treatments or when there is a calcium deficiency in crops. • It increases the resistance, elasticity, hardness and quality of the fruit skin. • To avoid alterations in the fruit due to a lack of available calcium such as “peseta” or “tip burn”. • It improves the quality of pollen, fattening and fruit setting. • It diminishes the possibility of falling of the curdled flower or small fruit. • It increases the quality of the harvest. It is a product formulated from Potassium Solutions with micronutrients. It is a potasic fertilizer of a quick assimilation, indicated for obtaining a bigger size, better colour and level of sugar in the fruit. It increases the size of the fruit and the level of sugar. • Provides bright and intensive colour. • Better colour and organoleptic characteristics of the fruit. It stimulates the setting and fattening of the fruit. • A higher moisturising of the crops and a better resistence before situations of salt or water stress or extreme temperatures or weather. • It improves thequalityof the crops. It is a fertilizer made of liquid organic matter of vegetable origin enriched with a significant contribution of chelated micronutrients which enriches it with a balanced nutritional complement. It has an immediate nutritional and stimulant action. • It efficiently facilitates the absorption of inorganic elements of activo vigorizante soil. • It is also a invigorating asset to the crops and a soil regenerator. • It stimulates the development of soil bacterial flora. • The iron and manganese that provide these fertilizers give the plants an intense greenery even in case of soil high PH. It is a liquid microbiological solution with a probiotic action which is applied in the roots, aimed to regenerate the soil and revitalize the plants. This product includes a cocktail with the most important family of the soil bacteria. To regenerate the soil, improves its structure and biological, chemical and physical properties. • It decomposes the sugars, increasing the organic matter and improving the soil. • It transforms the organic matter, placing its nutrients in ways which are easily assimilated by the plant. – It releases 90-95% of the Nitrogen (N). of the supplied fertilizers (the useful fertilizer, under normal circumstances does not exceed a 60-65%), and in the same time prevents blocking of the N.
– It allows plants to accelerate their transformation in ions and its assimilation of the Phosphorus (P) and of the Potassium (K) of the soil, which implies a supplementary quantity of approximately 33-35 kg/ha/year both of P and of K.
– It also helps with the harmonious assimilation and activation of the micronutrients.. It stimulates the vegetable germination and growth bythe natural synthesis of the phytohormones. • It improves the production of activeroots. It is a special liquid formulation that provides all the nutrients, vitamins, minerals, enzymes, organic acids, polysaccharides needed by beneficial soil microorganisms to reproduce. Its effect on the soil is rejuvenating since in a very short time the rate of microorganisms rises by becoming the same with the Virgin soils. Increases microbial activity and humic acids in soils. Helps in the conversion of nutrients and absorption. It helps in the penetration of water and its retention. Acceleration in decomposition of residues and detritus. Decreasement of diseases and stress. Improvement in response to fertilizers. • It is a fertilizer that regenerates the soil, improving its structure and biological, chemical and physical properties. • This range of ecological fertilizers breaks down sugars, which increase organic matter and improve the soil. • The organic fertilizers transform the organic matter, placing its nutrients in ways which are easily assimilated by the plant. • It is a fertilizer that releases from 90 to 95% of the Nitrogen (N) of the fertilizers supplied (the useful fertilizer, in normal circumstances, does not exceed a percentage of 60 to 65%), and avoid blocking N.
• These ecological fertilizers allow plants to accelerate the transformation into ions and their assimilation of phosphorus (P) and soil potassium (K), which means an additional amount of about 33 to 35 kilos per hectare per year of phosphorus such as potassium. • The product also helps with harmonious assimilation and activation of micronutrients. • It stimulates germination and plant growth, by the natural synthesis of phytohormones. • The product stimulates the fertilization of the production of active roots. • Increases the resistance of the plant to adverse conditions such as water stress (essentially water deficit), thermal and saline. Vigore Calcium Organic is an organic fertilizer of high level of Calcium, formulated for foliar application or fertigation. Among its benefits, it facilitates the absorption of calcium because it is enriched with polycarboxylic acids and sugars. We can avoid various physiopathies due to lack of Calcium such as bitter pit, blossom-in-rot, tip burn and cracking. It also provides essential nutrients for the development of the crop. It is completely harmless and it has a simple and economic application, as well as it is compatible with other fertilizers or phytosanitaries. The product is non-toxic according to the OECD. Among its recommendations for use, we can say that Vigore Calcio Organic is a soluble liquid product, which usage is advised to prevent and correct calcium deficiencies in leafy or fruit vegetables, tubers, pome fruit and other crops such as tobacco, vine, sunflower, cotton and corn. Hydroponics: 10 liters / 1000 liters. Fertigation: 15-20 liters / Hectare (per week). Foliar: 1-3 liters / Hl. The most effective contribution of Vigore Calcio Organic will be made with particular applications until reaching the total dose.